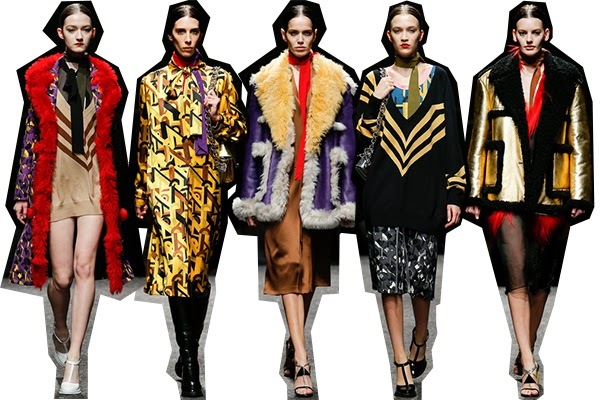 Prada is not a show that you immediately comprehend. Miuccia is an expert of creating thoughtful and at times confusing clothing that takes time to fully muster up a feeling about. Generally I get super excited for the Prada show and then turn away after the live stream has finished feeling a bit disappointed. It's never what I expect and I can never quite understand it the first time around. And if I'm being completely honest, the clothes are sometimes not the most generically beautiful, which is of course what makes them so difficult to digest on first viewing. For the Fall 2014 show we had a bit of a hint as to what it was going to look like a few weeks ago during Men's Fashion Week, where several female models came out in looks of a very similar color palette to the collection today. Tim Blanks described Thursday's show as "Act II" in his style.com review, with this being the second installment to be inspired by the German avant-garde movement in in particular Rainer Werner Fassbinder's 1972 film The Bitter Tears of Petra von Kant. There was a mix of time periods here - on the one hand I could totally see Amy Adam's character from American Hustle fawning over the shearling coats in vibrant colors and the disco print silk dresses; on the other, there were the drop waists and fringe details of the Weimar era, where German avant-gardism flourished. While not the cotton candy colored collection that was Spring 2014, fall feels very bold and glamorous in an entirely different way. And actually, I think this is one of the most "understandable" collections that Miuccia has produced in a while. That doesn't make it any less intellectual, but it is stunning and I can see that more easily with this collection. Which probably means I'll only love it even more over time.